When I first started out experimenting with growing vegetables, Methi was my first garden attempt. What I found was It works no matter you have green thumb or not. 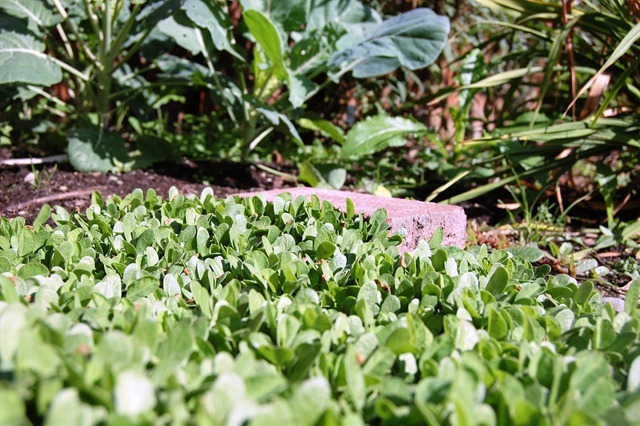 Methi is easiest to grow, ready to harvest in as little as 30 days. I was delighted to taste tender fresh methi from my own garden very first time I harvested, yield is far better and bigger than what you get at your neighborhood Indian store. Most of the Indian stores sell methi wilted, about to make seed pods and sometimes it tastes like grass. And I used to pay 99cents for few twigs of methi. Well, not anymore. From early spring till late fall, I grow my own methi and buy frozen packs for rest of the year. Methi is semi-cold hardy so light frost doesn’t kill it. Methi makes it the perfect crop for those who just can’t wait to get the garden going, just open the pantry and soak some methi seeds in water. 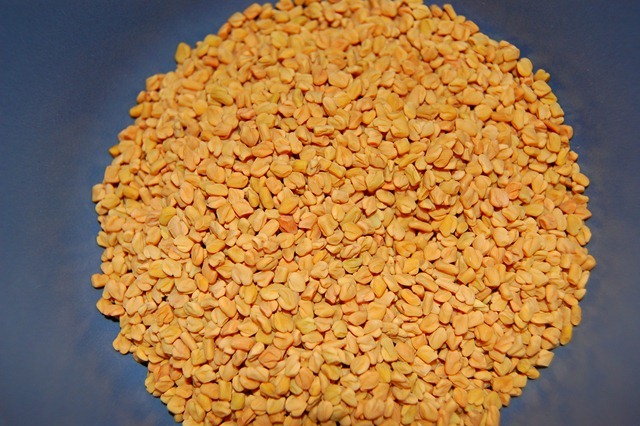 1 – Methi (fenugreek) seeds are sold in Indian grocery stores, $1.99 packet will get you more than 500 seeds. Store bought seeds work beautifully. 3 – Prepare ground by working soil, adding some compost. Methi can be planted in containers as well. Methi seeds are seeded densely (not in rows). Scatter methi seeds dense in desired growing area. 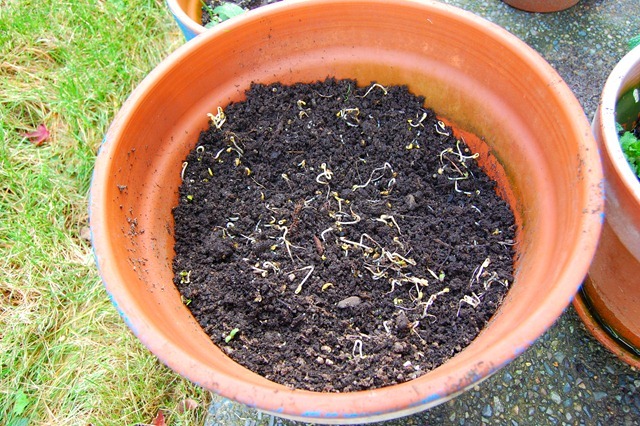 5 – Germination is expected in 1-3 days, methi seeds upon germination look something like above. 6 – Ready to harvest in 30-35 days. Some harvest methi as micro-greens, just before first true leaves appear. Fleshy first leaves are bitter and are used extensively in daal or with fish preparation in Mumbai cuisine. If harvesting for micro greens (samudri methi), it is ready in 5-7 days after germination. Also, I found that methi develops it’s trademark bitter pungent taste in warmer, hot weather. Methi grown in spring and fall has mild taste. More about Methi: for those with botanical interest, methi belongs to legume family(Fabaceae) – flowering plants that produce edible seeds. 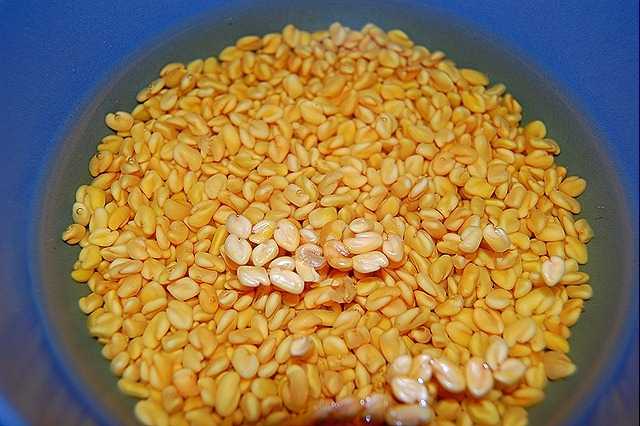 Fenugreek is termed as Trigonella foenum-graecum. medicinal properties: In West, fenugreek is widely used by lactating women to boost milk supply. Tablespoon of fenugreek powder 3 times a day is the trick. Fenugreek is natural remedy to control diabetes. Thanks for the information on growing Methi. The herb is very uncommon here in Denmark. I only know about 2 store that might stock Methi in the whole of Copenhagen – the capital of Denmark. Even if I take the time to travel to one of the stores, I am never sure if they have methi in stock. Methi is semi-cold hardy, pre-soaked methi seeds can be scattered on the ground even in early spring. I already have methi growing in container, we got daytime temps in 60s (15 C) and nighttime in 40s (5 C). I believe you also have similar weather pattern now so growing methi now should not be a problem. It is such a easy crop that it doesn’t need much gardening science. 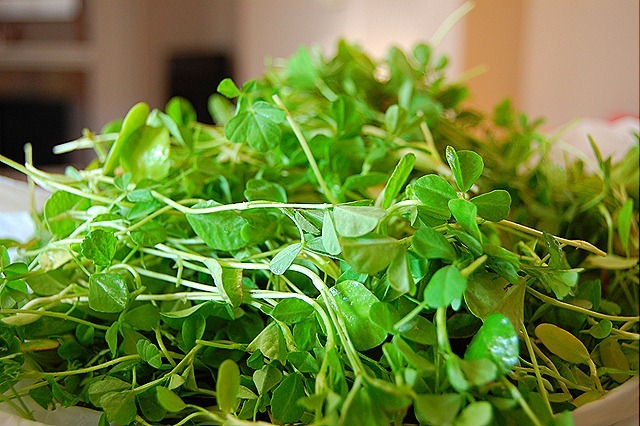 The methi looks great – green and fresh. Nothing better than home grown one! @Uj yes I agree,nothing like home grown methi. This year’s first methi is coming up nicely, I am thrilled as it is holding on despite of poor weather and no sunshine. Read your how-to and just added methi seeds to an oversized container where I’m growing a small tree. Now it will have company! @FenuNick Yes, Methi will grow happily in overzised container, are you planning to use it as greens or for seeds? Thank you for trying. i had sown methi and it germinated and was growing pretty well but it stopped growing and the leaves became pale and dry? Where could i be going wrong? hi, i found your blog by chance & i like it so much! growing fenugreek is totally new to me, never had i imagined it before. how do you cook the greens? would it taste nice in stir fry? I’ll try next year too.